In September 1993, two disillusioned television producers and a group of activists came together to explore the potential of using domestic HI8 camcorders to bring about social and environmental change. Based in North London, we filmed and edited footage of the dramatic M11 link road protests. Under the name of Small World media, we gathered video footage from activists all over the UK and decided to create an alternative distribution views and perspectives rarely heard or seen on mainstream television- it would become known as Undercurrents. 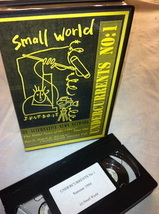 'Undercurrents the alternative news video issue 1' is released on VHS tape on April 1st. Most notable feature included the country's first video feature informing about the imminent introduction of the CJB.The first batch of 250 tapes run out in a matter of weeks and press reviews are very positive. The Guardian tells readers that "Undercurrents shocks, informs and exposes." We move into a resource centre in Archway in North London, sharing with other campaign groups. The Camcorder Action Network is set up to co-ordinate the increasing number of video activists getting in touch. Undercurrents 2 is released in December, with six first time video activists making their first campaign videos. Undercurrents wins the first of many international awards with first prize in the prestigious German OKOmedia festival. To serve campaigns outside London much better, Undercurrents moves to Oxford and gains charitable status.The first Undercurrents stake holder meeting is held which brings a wide range of activists, media workers and visionaries together to plan the future of Undercurrents. A constant stream of volunteers join. "the news you don't see on the news". Undercurrents move into more long-term offices in Oxford. The first nationally co-ordinated launch screenings of Undercurrents 5 and 6 are held. Over 3000 people watch issue 5 on one evening throughout Britain in May. We create the country's first grassroots protest video archive where video activists store over 1000 hours of their footage for present and future generations. The Independent declares 'Resistance culture sets up own news network'. Undercurrents wins awards in Britain, Brazil, France, USA and Japan. Channel 4 TV broadcasts 2 x 30 minute compilations from the alternative news videos. 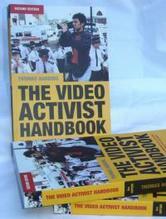 A founder of Undercurrents writes and releases (through Pluto Press) the 'Video Activist Handbook'. Three years funding is gained to expand our archive and soon footage from video activists is included in over 100 TV programmes, broadcast around the world. Undercurrents 7 is released to over 5000 people in 5 countries in one evening in September. Our first website www.undercurrents.org is launched. Demand for workshops and lectures on our work from media educators and activist groups increase. 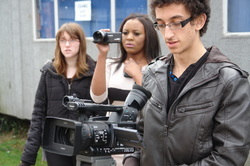 Undercurrents sets up regular workshops and a qualified media educator joins our crew to enable alternative media's inclusion on the national examination board.Undercurrents gains three years' funding to set up the first 'Video Activist Training' project. Undercurrents exposes a threat to press freedom with the investigative documentary 'Breaking News'. Our investigations lead to awards, press exposure, and begin negotiations between police and journalists for the freedom to report unhindered at protests. Undercurrents 8 and 9 are released. The final and tenth issue in the alternative news video series on VHS is released in April. More of our resources are diverted into increasing the distribution of grassroots news videos. More than 30 cable stations across the USA and Australia broadcast 10 specially compiled programmes of undercurrents. Undercurrents sets up a workshop in Swansea, South Wales. Our offices in Oxford are bought by the Ethical Property Company, renovated and re-opened. Our website increases in popularity as we begin streaming video features. Many new staff and volunteers join us. Undercurrents collaborate with many other grassroots media groups to coordinate the reporting of the J18 Carnival against Capitalism which shuts down the financial city of London. Our strategy of covering of the event with many grassroots reporters, video activists, photographers and radio and DJ's and geeks resulted in the launch of Indymedia, a network of independent media groups which would spread the World. Our 21st century projects include the first BeyondTV video activist festival launched in December which then travels to Australia and Ireland. A series of weekly undercurrents webcasts begin under the name of Pirate TV. A collection of undercurrents video features joins Picasso and Andy Warhols' art in the Tate Modern art gallery in London. Undercurrents works closely with comedian activist Mark Thomas. Our alternative news video continues to be in huge demand. Undercurrents goes global with trips to Korea, USA and Brazil to help set up video activist training projects. Undercurrents take part in high level debates about mainstream reporting of protests with heads of news at ITN, CNN, BBC, SKY and C4 at the Edinburgh TV festival. Undercurrents release the hard hitting documentary, Globalisation and the Media. We report from the battlegrounds of the Middle East giving Palestine a much needed voice. Exclusive images we obtain are broadcast in a BBC documentary. Undercurrents are chosen by commedia to support people to produce a host of community media projects. For the fourth year we lend media support to the Big Brother anti-surveillance awards. 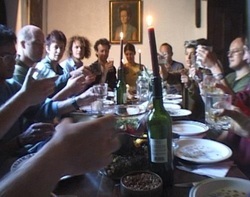 We host the first European Video Activist gathering in Oxford. Our growing 'Beyond TV' video activist festival is held in Wales for the third year running. Undercurrents wins top awards in Japan and Canada for our documentaries. Undercurrents is chosen to be screened at the Hay on Wye book festival and the British Film Institute history festival. We release an excellent documentary about mental health titles Evolving Minds. We explore the decline of rural life in The Village. In a direct response to September 11, we release 'War Within', a film produced from a spiritual perspective by an English Buddhist. Teaming up with Peace News we release Informed Dissent our first CD-ROM production with Noam Chomsky. In October, Undercurrents merge our Oxford and Swansea workshops and host the 4th 'Beyond TV' video activist festival. It is a huge success with 400 people attending to see inspiring films. In December, we renovate our Swansea video workshop using only wood from local (South Wales) sustainable forests. 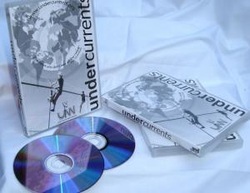 April 1st - exactly ten years after the release of Undercurrents' first video, Undercurrents News Network is launched on VHS and DVD in London and is then screened in 20 towns and cities around the country. We tour the festivals screening hundreds of short films and host our biggest BeyondTV festival yet in Swansea to celebrate our 10th Birthday. In November we release Life Before Death- a film about facing terminal illness.It is our first short film produced for the cinema. Sri Lanka. We travel to hospitals, villages and relief camps supporting individuals bringing about grassroots change. We begin to produce programmes for the Community Channel. Undercurrents performs stunning VJ visuals for the opening launch of the £33m Waterfront Museum in Swansea. A resource centre is opened in East Oxford and managed by an undercurrents volunteer to help video activism grow. Undercurrents screen our films at the base of a gigantic waterfall in Iceland becoming the most Northern area we have ever reached. We produce a film about this years Glastonbury festival and also launch the Mark Thomas political comedy show on DVD. We host the first Media Activist awards (MISTY) as part of the 6th BeyondTV video activist festival. In January Hamish, an undercurrents reporter, travels to Genoa to present his video vidence of a brutal police raid during the G8 protests back in 2001.In February Undercurrents premiere our inspiring film about a Welsh communities history of living around waterfall for the National Trust. On March 8th we launched Broad Horizons, a DVD compilation of female video-makers to celebrate International Womens day. Helen of undercurrents wins an award at the Tokyo video festival for Life before Death. The film is also praised at the Cardiff Film Festival. Undercurrents supplies images for the cinema movie about the Glastonbury festival. After a decade of using PCs, we change to Mac edit suites and get our first HD camera. In May we travelled to the Balkans and held video activist workshops. We roll out a BETA test of OfflineTV, a peer to peer distribution for video across the internet. From June to December we produced monthly reports about Wales first Ecovillage for the community channel. Our archive images are used in a Channel 4 series on protest.We explore the world of the Lesbian in a new film to mark the first year of civil partnerships. The 7th annual Beyond TV international video festival in December is a great success spanning an entire week with varied themes. Undercurrents survived the wettest summer but still managed to show great films at music festivals across the UK and Eire. We successfully raised basic funds to create a mobile solar powered cinema. In July we released a Climate change solutions DVD in association with Permaculture magazine. The DVD includes Ecovillage Pioneers amongst other inspiring films. In August we begin producing regular 'podcasts' which include On the Push and A-Z of Bushcraft skills.We host the 8th annual BeyondTV festival in Swansea drawing in film makers from New York and Melbourne to present their work. Undercurrents train dozens of Swansea people in community video workshops empowering many to work within the film industry or to continue with community work. Undercurrents has spent most of 2008 putting lots of energy into creating a new online TV channel for inspiring films. VisionOnTv. We plan to launch fully in 2010. Our exclusive images of the occupation of mechanical diggers, in protest against the largest open cast mine in Europe are broadcast on ITV and BBC news. Our RSS feeds of our various video series gain in huge popularity. Last year more than 1 million people watched our films online. We launch the popular Living in the Future online video series and Bike2Oz video series. Despite a £5m Police budget to stop a Climate Camp protest at Kingsnorth coal powered station in Kent, Undercurrents still managed to establish and run a brilliant live TV studio inside the camp in August.We produced and distributed chat shows about the daily protests for VisionOn.tv. Beyond Tv film festival was as lively as ever with a packed hall for 1 Giant Leap - the sequel, introduced by cinematographer Ben Cole. On the Push in the Swansea Bay Film festival and VHS dress won first prize in 'State your Independence' Film festival. 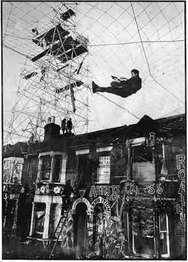 We struggled to show films in solar powered cinemas through the very wet festivals of Glastonbury and Buddhafield. We were outraged that the Police sabotaged the Big Green Gathering and shut it down 3 days before it was due to open. Undercurrents images made headline news in 2x BBC Panorama and a Channel & Dispatches investigations into the violent policing of protests. Our images of activists dressed as Polar Bears made BBC and ITV Wales stories about Open cast mining much more cheery. We also supplied footage to an investigation into Police mishandling of the Climate Camp in 2008. Our Surfers Guide to Climate Change- On the Push was launched on DVD and online as an educational resource with screenings and workshops held around the coastline of the UK. A new era begins as we begin to move from DV tape and purchase our first tapeless camera- JVC GYHM100 and we also upgrade to HD with the Sony HRV-Z7. We also launched a DVD of the first series of A-Z of Bushcraft with a novel way of allowing people to pay what they can afford. In August we launced Living in the Future - an online video series chronicling the development of Lammas- the UK's first official Ecovillage.We released a DVD later in the year. We hosted citizen journalist workshops in London and ran a live TV studio during the cheeky but radical Climate Camp as Climate Camp TV. One of our films about a protest against CCTV goes viral with 4million viewings.We had a host of awards with Network Wales awarding us for our use of digital media. 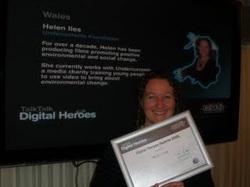 In November 2009 Helen from Undercurrents was declared Digital Hero of Wales and was awarded £5000 in the Digital Hero awards in the House of Lords. We kicked the year off in January by winning an award in the Vodaphone Foundation World of Difference. This award will pay Emily James, a professional production manager to work for Undercurrents for 2 months.Our new Solar Powered Sol Cinema is a big hit in Ireland at St Patrick's day festival in Dublin and is booked for events all over the UK. Sol Cinema performs in Scotland at a huge music festival, community events in Wales and Kent, The Barbican in London and even the Lush soap factory! Our application to communities@2 to establish an online TV channel for Swansea was successful and we began work on Swansea Telly in October. The project will aim to get more people included in the digital revolution.In September we launched a DVD about Eco-building with film Ben Law (made popular by building a wooden house on Channel 4's Grand Design). 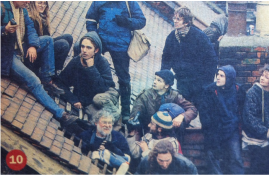 In November we supplied archive images to a documentary which aired on Channel 4.A group of environmentalists are challenging the movement they helped to create. These life-long die-hard greens advocate radical solutions to climate change, including GM crops and nuclear energy.Undercurrents are called 'Pioneers' by The Ecologist magazine. They stated Undercurrents: the campaign film pioneers still setting the agenda.Undercurrents held video training workshops for the disadvantaged all over Swansea. We raised funds to buy equipment to get our archive digitized. We begin the long job of getting 1000 hours of history onto hard drives to protect it for future generations.In December Undercurrents won the Network Wales Award for best communication project (Sol Cinema) of an organisation. We were awarded a crystal bowl. Undercurrents began the year by successfully exposing a company who has been running a scam against international fillmakers.We gained national newspaper coverage for our investigation and forced the celebrities patrons Catherine Zeta Jones and Michael Sheen to resign. Undercurrents came 3rd in the UK wide Cooperative awards and we also got into the semi finals of the National Lottery awards. We produced 3 short films with young people for First Light to celebrate the Olympic ideals. One of these films wins an award and will be shown during the Olympics in 2012. 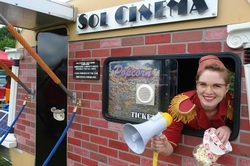 Our Sol Cinema toured Wales showing inspiring films in conferences, schools and festivals. In April our A-Z of Bushcraft online series topped over 1million viewings. A nationwide workshop tour of training citizen journalists is successful while our online TV channel Visionon.tv carries on developing.In November our project administrator D Murphy won the Digital Hero Award for all Wales for our Swansea Telly digital inclusion project. During a ceremony in House of Lords, she is granted £5000 towards our latest projects. We start the year with our Sol Cinema winning first prize in the Epic awards (for Arts projects). Our Swansea Telly projects comes to it's 2 year end and we explore new avenues for producing local community online television. In March 2012 we launched the online Premiere of 2012 The Mayan Word. Two years in the making, the movie explored how the world was talking about the Mayan Prophecies of 2012 but who was listening to the Maya people? The movie was made available in Spanish and English and free to download for public showings. We generated more than 100,000 viewings in the first week. 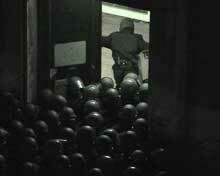 In April, Diaz, an Italian movie premiered about the brutal Police raid in Genoa on innocent protesters. Undercurrents recorded the brutal raid and our footage was used to prosecute Police. Diaz the movie had an actor playing the role of the Undercurrents video activist. We ran a Reach for the Heights project producing music videos with hard to reach young people. In July film director Julien Temple bought our images to use in his homage to London. 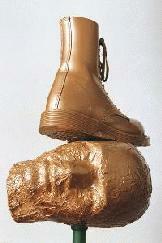 His movie was shown in cinemas and public screenings and also broadcast on BBC. Our Visionon.tv project grows and extends the trial period to another 6 months. In Autumn we begin an Arts Council of Wales funded project commemorating 100 years of Swansea football club. We will make short participatory videos with local Asian youth about racism in football. Our Sol Cinema spent 2 weeks in the Barbican entertaining audiences with films produced and curated by young people. In our 20th year, Undercurrents begins the year with one of our key workers moving to Australia. 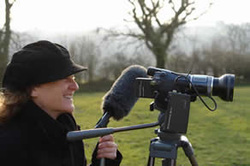 Helen iles has been filming the Lammas ecovillage development in West Wales. We launched Helen's 60minute movie about Lammas in cinemas all over the UK and also made it available to download or view streaming. 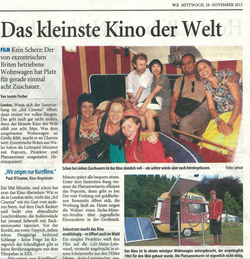 German newspapers go wild for our little solar powered cinema. In March we perform with the cinema in a snow blizzard in Birmingham and despite below zero temperatures, our usherettes manage to show many short films during the Flatpack film festival. We explore how Cannabis could be regulated in the UK by filming in different countries on how the drug is being controlled there. To celebrate May Day, undercurrents presented our work to Political students in Liverpool university. Undercurrents has spent our time reporting frontline direct action at Yarlwood detention centre, Nuclear Weapons factories, Fracking sites and much much more. We released Power Trip:Fracking in the UK and toured it all over England in Summer 2018. We are still producing the News you don't see on the News!